Click the link below to see the order form. 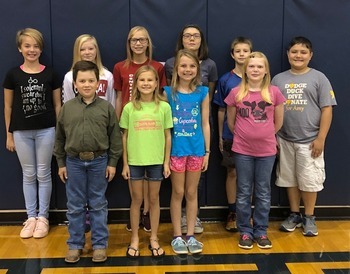 Central Elementary is proud to announce our Student Council members for the 2018-2019 school year! These students represent the student body as a whole and will share ideas, concerns, and interests throughout the year. They will also lead the building in community work and fun activities. Staff and students at CES are proud of their accomplishment and wish them good luck as leaders for our building community. Students (back): Malory Blackburn (6th), Ady Fagan (6th), Josey Toon (6th), Brianna Lamkin (5th), James Braun (5th), Darren Underwood (5th). Students (front): Lane Moore (4th), Fynlie Ahlstedt (4th), Lily Pankratz (4th), Adison Henderson (5th). Culinary Arts class to Pawhuska, OK- lv.8:00 a.m.
HS Track @ Cheney-4:00 p.m.
Career Fair @ CES-1:00 p.m.